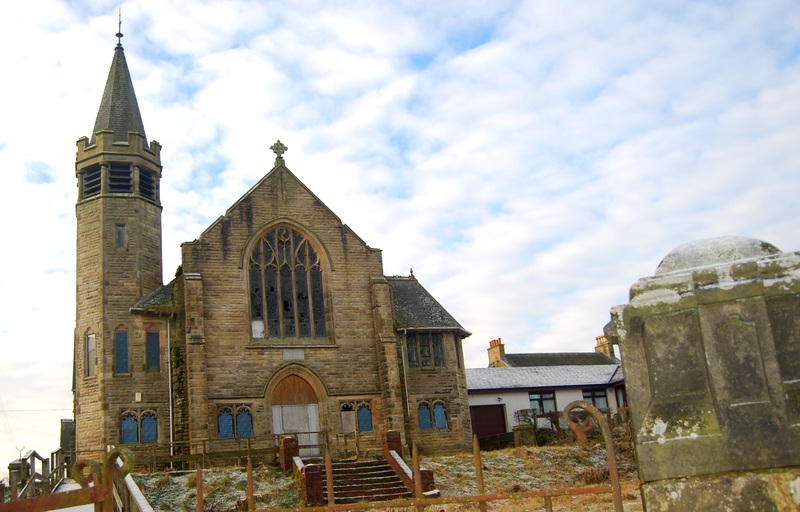 New Cumnock recently lost one of its best known landmarks following the demolition of the Arthur Memorial United Free Church that had stood majestically on the castle hill at the heart of the village for just over 100 years. The building had been lying empty for many years but its loss has stirred many fond memories of the people that met there in fellowship. The memorial stone lodged above the door was laid on September 7th, 1912 and the elegant church was named after local benefactor William Arthur, farmer at Wellhill. It replaced the original Free Church that had been erected there in 1843 at the time of the great schism in the Established Church of Scotland, known as the Disruption. 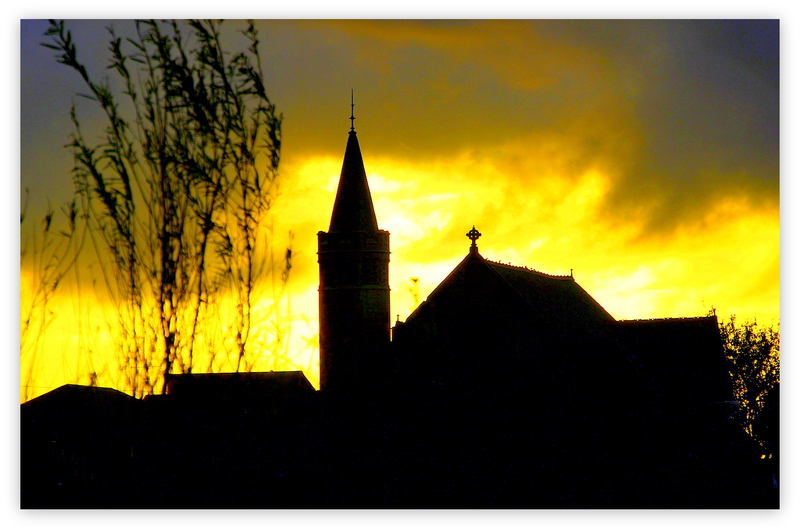 As in many communities throughout Scotland the Reverend Mathew Kirkland, minister of the parish church, left his charge and was followed by many of his congregation and fairly soon the Free Church, its manse , school and school house covered the crown of the castle hill, only the manse now remains. 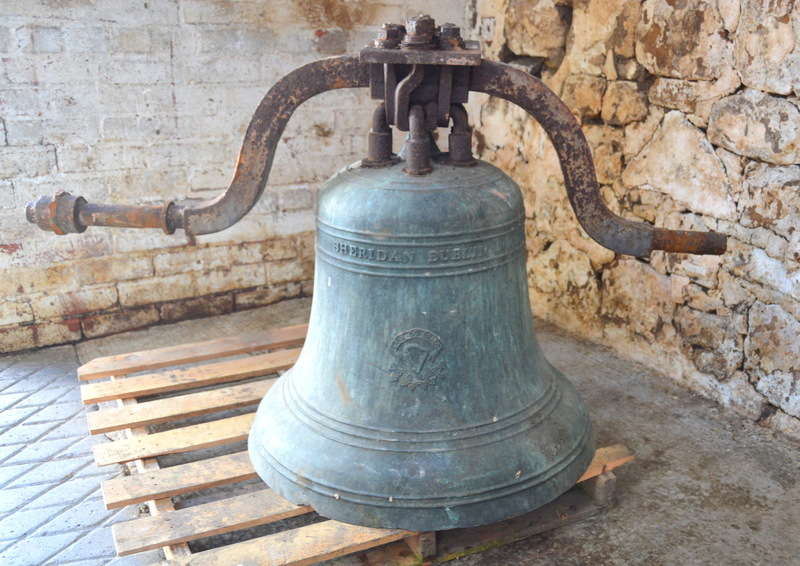 Local firm W.L.McClounie Ltd. were contracted to carrying out the demolition of the Arthur Memorial and quickly recovered the church bell, bearing the date of 1885, which clearly had previously rang out from the original Free Church. The excitement intensified when a time-capsule was then discovered behind the memorial stone of 1912, lovingly and carefully secured in the cavity of a dressed stone. The bell, time-capsule, memorial stone and the small stone cross that adorned the church roof were temporarily transferred for safe-keeping to the McClounie family home at Meikle Garclaugh farm. 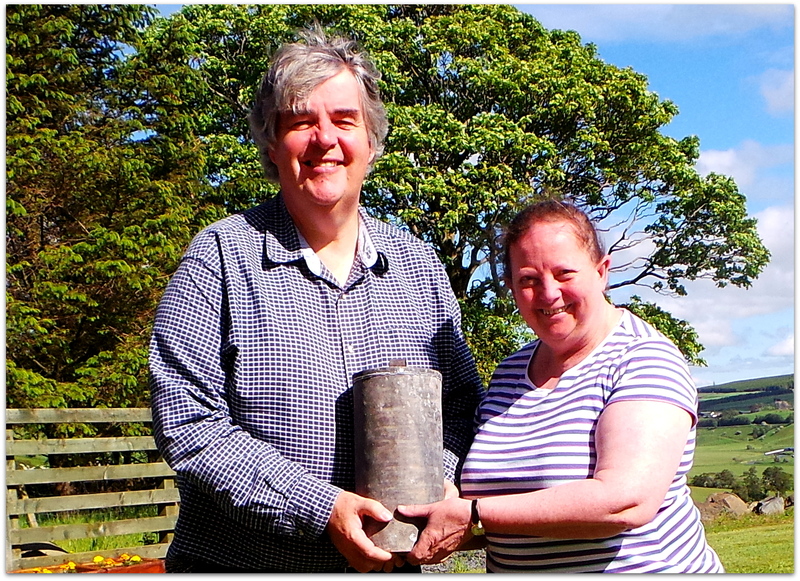 On a glorious sunny day minister Reverend Helen Cuthbert and local history enthusiast Bobby Guthrie visited Meikle Garclaugh where Lindsay McClounie carefully opened the time capsule. 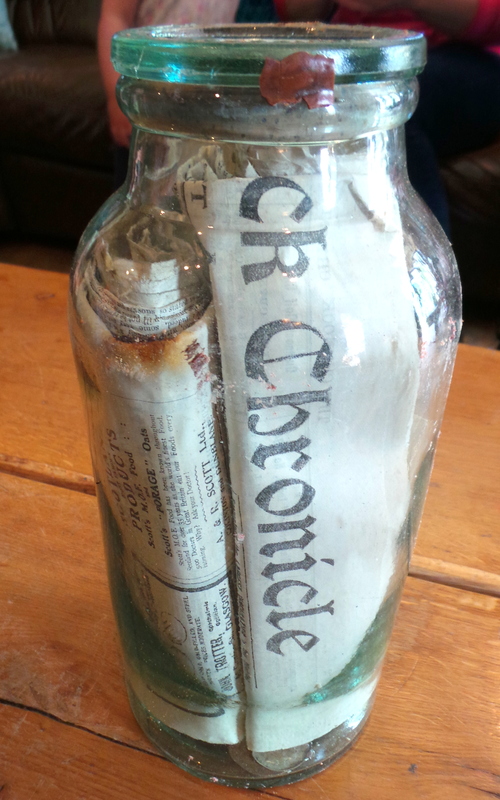 Within the metal canister was a sealed glass bottle with a copy of the Cumnock Chronicle in clear view and with the lid removed the rest of its treasures were soon revealed. A small box wrapped in a hand-written note listing its contents including remarkably items retrieved from a time-capsule that had been placed in the original Free Church when laying the memorial stone on 29th August 1843 – a Commemoration Medal of the First Assembly of the Free Church and three coins, penny , halfpenny and farthing of the period. To match this in 1912 were added a William Arthur Medal and coins of that period. Also belonging to the 1843 time capsule was a copy of the Ayr Advertiser or West Country Journal, a hand written note commemorating the laying of the memorial stone in August 1843 with the names of the Church Elders and Committee alongside that of Rev Mathew Kirkland and a copy of the national Protest of that year. The 1912 components, alongside the Chronicle and coins, included the Church Financial Accounts for 1911 and other church literature of that time. To honour these finds and the memory of the Arthur Memorial Church it is planned to hold a ‘Memorial for the Arthur Memorial’ in the Parish Church, later in the year, when the contents of the time capsule will be on display. The Reverend Cuthbert explains ‘it is clear that the demolition of the Arthur Memorial has touched many people bringing reminders of special times in their lives and the lives of their families whether weddings, Baptisms, steps of faith, times of fellowship. It would be great to be able to gather these memories together as a tribute to the times and people who influenced us. We would love to hear their stories and be delighted if they could come forward and share any photos, documents or artifacts from the church to form part of the Memorial Display in the church’. Bobby Guthrie added, ‘as part of our recent Auld Kirk & Village Heritage Trail project we recognised the Arthur family’s contribution to our parish and restored the family lair in the kirkyard. William Arthur was also one of the parishioners researched by the school children, as was Andrew Stirling the Free Church Schoolmaster. It seems fitting that we now do something to preserve the memories of the Arthur Memorial Church and Free Church and catalogue the time-capsule findings. It would be tremendous if we could raise funds to purchase and restore the impressive church bell and give it a place of prominence in our heritage landscape of the future’. We are also looking for people to join a group to help organise the Display. If you are interested in being part of this, please contact the Reverend Helen Cuthbert on 01290338296 or Bobby Guthrie at rguthrie65@hotmail.co.uk. What a great discovery. No trace of any foundations of the castle?